Explore this subject through images from across the MFA’s collection. The New England painter William Morris Hunt met Jean-François Millet in 1852. He had been studying art in Paris and had seen the French painter’s masterpiece, “The Sower,” at the Salon. With his friend William Babcock, Hunt traveled to Barbizon (near Paris), where Millet lived, to buy the painting. He stayed for two years, working alongside the revered French master and emulating his style and subject matter. 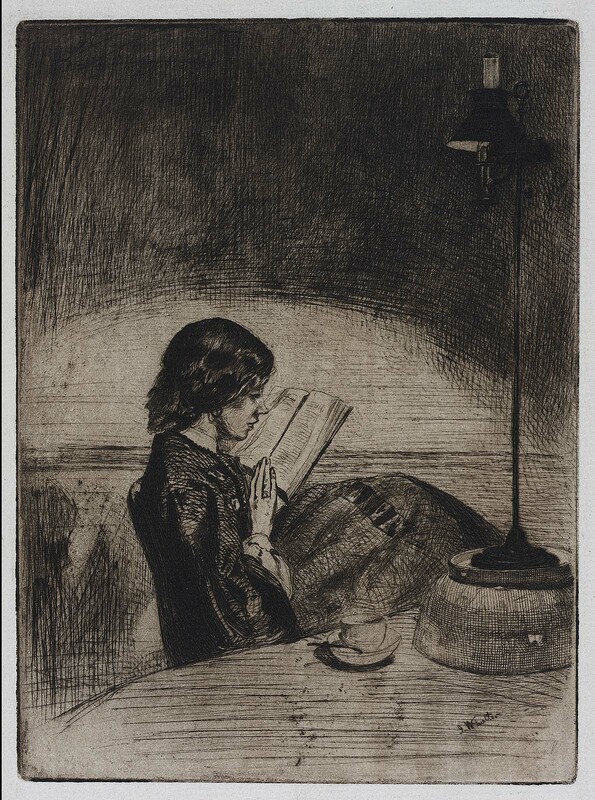 “Girl Reading,” a quiet image of a teenaged girl seated in a dark interior studying a book, was inspired by Millet’s paintings of young French peasant women sewing or spinning by lamplight. In those pictures, the women are working at domestic tasks after a long day of working in the fields or tending their flocks. Millet’s humane naturalism elicits the viewer’s sympathy. In Hunt’s painting, the warm light, soft paint handling, and delicate, subdued colors similarly indicate the artist’s affection for his subject. She, however, is clearly middle class. Hunt has transported Millet’s scene from a peasant’s humble cottage to an American parlor. This text was adapted from Carol Troyen and Janet Comey, “Children in American Art” (Nagoya/Boston Museum of Fine Arts, 2007, in Japanese). 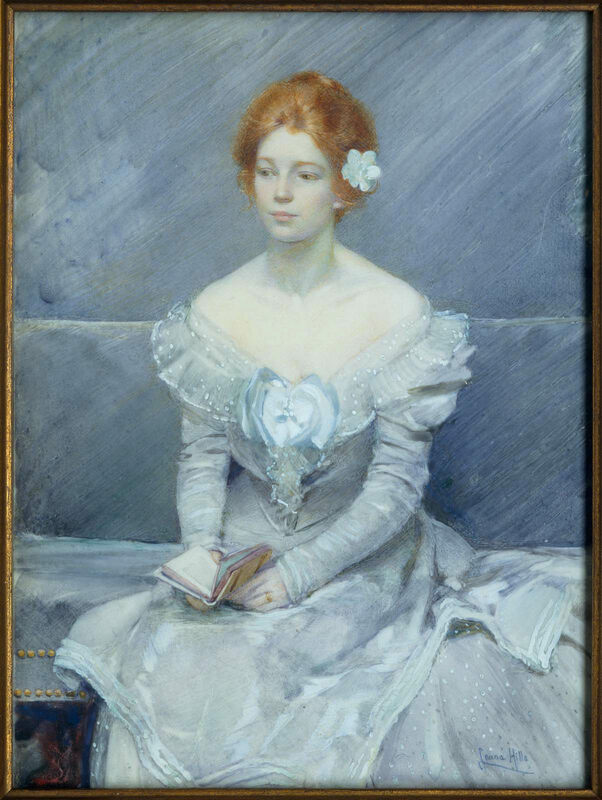 In a 1921 letter to MFA director Arthur Fairbanks, Tarbell wrote of Girl Reading: “I think it the best single figure I ever painted.”Executed in 1909, the work illustrates Tarbell’s return to a figural style reminiscent of his early art training in both Boston and Paris, and serves as a pivotal work in his early-twentieth-century oeuvre. 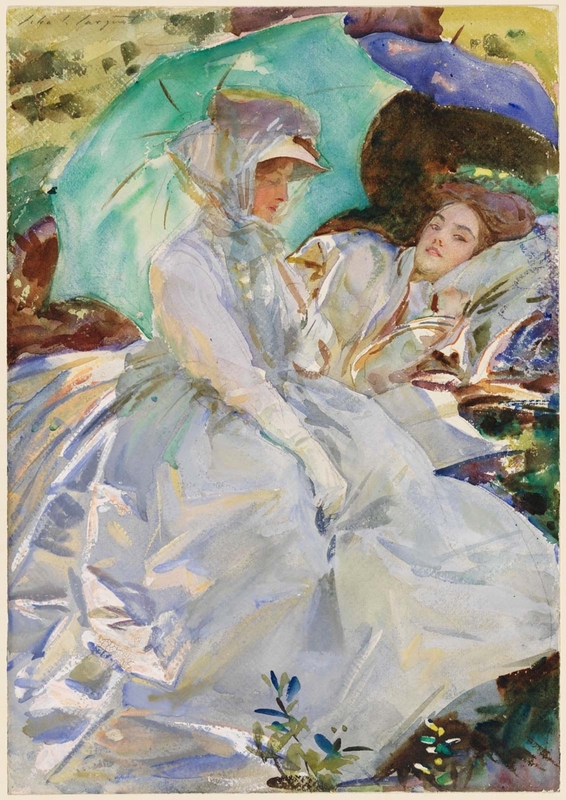 The smooth application of paint, muted tones, and soft, glowing light link the painting to works by close friends William Merritt Chase [2007.7] and Joseph DeCamp [33.532], and also recall the much-admired seventeenth-century Spanish painter Diego Velázquez [http://www.mfa.org/search/collections?artist=Diego%20Rodr%C3%ADguez%20de%20Silva%20y%20Vel%C3%A1zquez&objecttype=54], while the asymmetrical placement of objects and sitter suggests Tarbell’s interest in the format of Japanese prints. The natural light seeping in through the window at the extreme right seems almost holy, transforming the model into a kind of modern Madonna: “Natural daylight was one of the most sacred objects in Tarbell’s artistic religion.”The painting’s quiet, contemplative subject and subtle harmonies of light and color also reveal Tarbell’s admiration for interiors by the seventeenth-century Dutch masters Johannes Vermeer and Pieter de Hooch [03.607]. Vermeer, in particular, had become increasingly popular with collectors and scholars alike; fellow Boston painter and Museum School teacher Philip Hale would publish the first American monograph on the artist in 1913. In it, Hale wrote: “Mr. 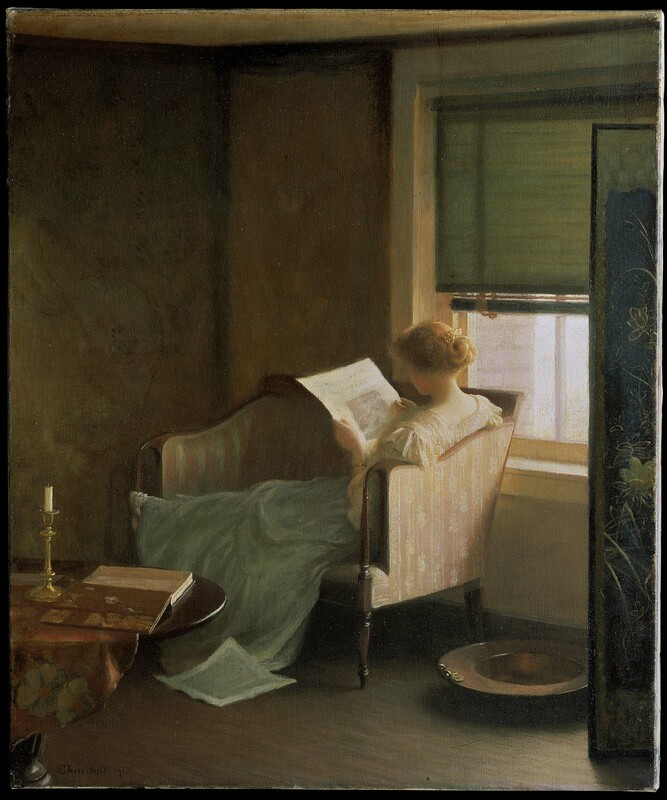 Edmund C. Tarbell’s work shows such skill in design and technique that one instinctively thinks of Dutch art and of Vermeer in particular when seeing it,” adding, “Mr. Tarbell’s work shows the effect of the Impressionistic movement when grafted on good old Dutch stock.”De Hooch’s influence on Tarbell’s interiors is perhaps even more notable than Vermeer’s; Tarbell himself remarked that setting was primary and story secondary for de Hooch, and he emulated frequently de Hooch’s use of doors opening into other rooms, figures silhouetted in passageways, and light streaming in from one area to another. 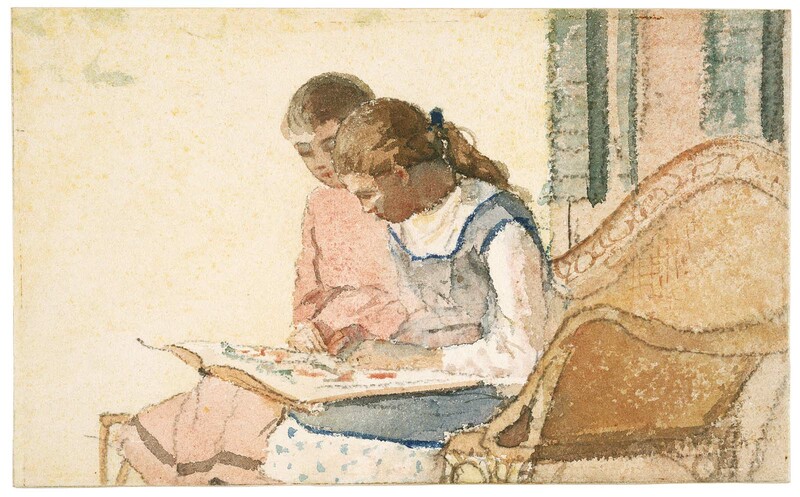 Tarbell’s admiration for Dutch art extended to his choice of frames, and he commissioned from the Boston firm Foster Brothers a hand-made one specifically for Girl Reading, decorated with geometric checkered and rippled patterns taken directly from old Dutch frames. 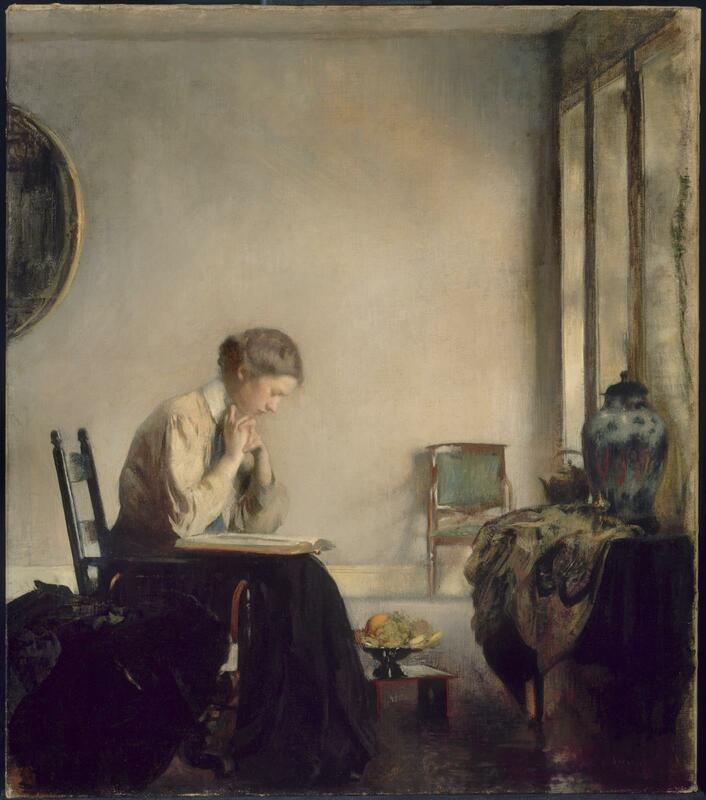 Tarbell used light and atmosphere not to tell a story but to paint elegant subjects with technical precision, stating once that “art should try to render the beauty of the thing unseen.”Boston School artists often painted women in graceful interiors, and some scholars have criticized their works as anti-modern and anti-feminist. 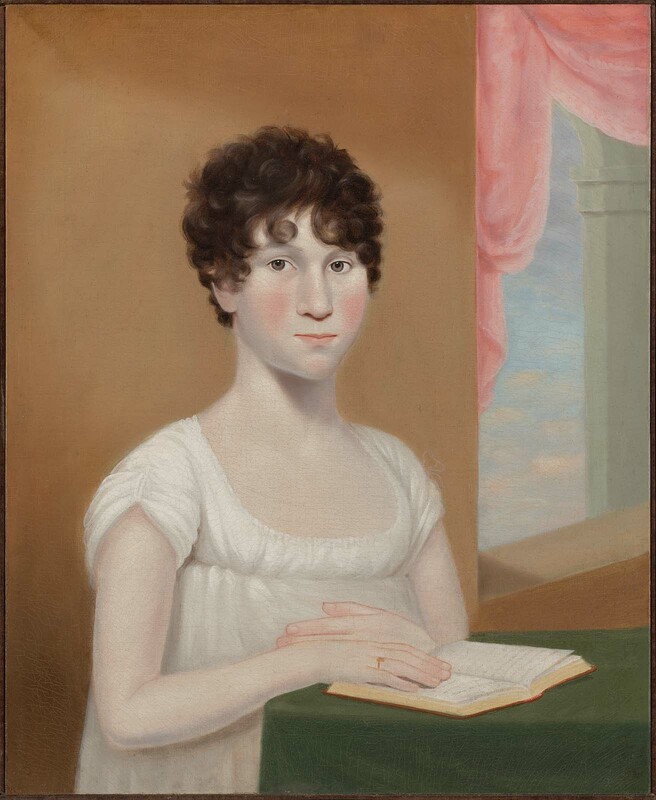 The sitter for Girl Reading, Charlotte West, is depicted, however, as a flesh-and-blood woman in a contemporary setting, dressed in modern clothing, and actively engaged in her book. West was one of Tarbell’s favorite models and one of the few who was not a family member. She also posed for his colleague, Museum School sculptor Bela Pratt [48.350], which sometimes created a conflict for the two artists. According to West’s letters, Pratt once chastised Tarbell for working their model too hard and insisted that she would be too tired to give Pratt the pristine look he sought. As a result of the sculptor’s proprietary attitude, West did not sit for Tarbell as often as he would have liked. 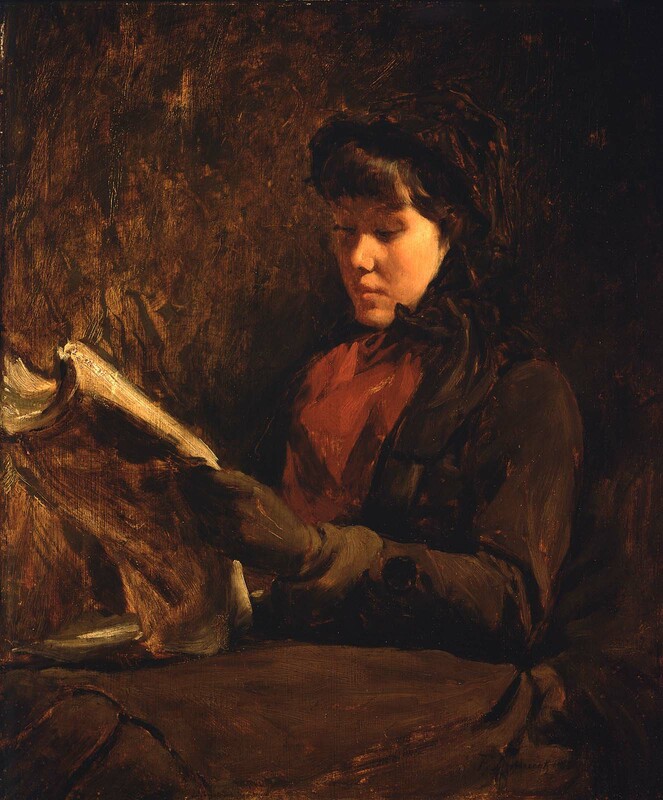 West could have posed for Girl Reading either in Boston or in New Castle, New Hampshire, where Tarbell’s family spent summers. West had made the short train trip from Boston to New Castle during September and October of 1907 to pose for Preparing for the Matinee (Indianapolis Museum of Art, Indiana). 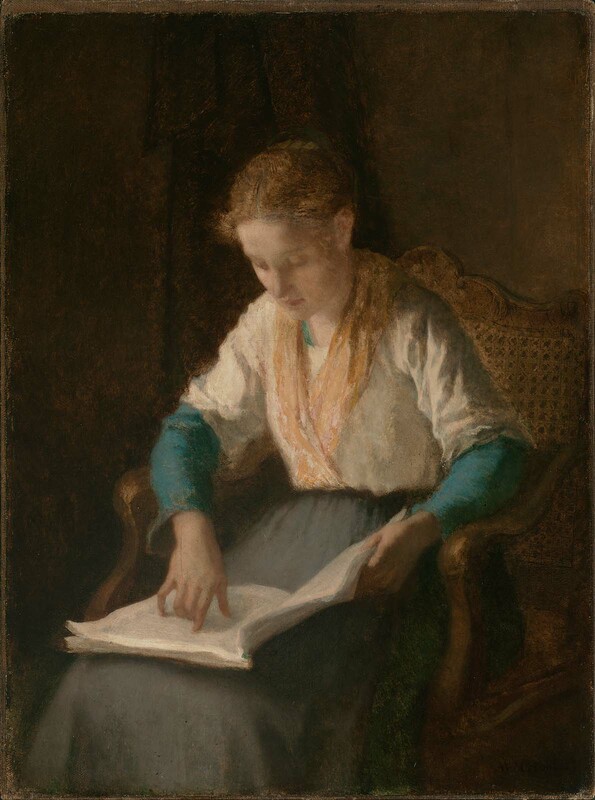 The stark setting for Girl Reading resembles the bare walls of the New Hampshire studio, visible in a 1907 photo of West and Tarbell at work on the Indianapolis painting. Tarbell’s choice of studio props—the gate-leg table, ladder-back chair, and gilded round mirror—suggest his New England roots and illustrate his awareness of the current popularity of Colonial Revival furniture in home decorating. Tarbell may have purchased these antiques with his friend Frank Weston Benson [1979.615] in Salem, Massachusetts; records show that the two painters each owned several gate-leg tables. 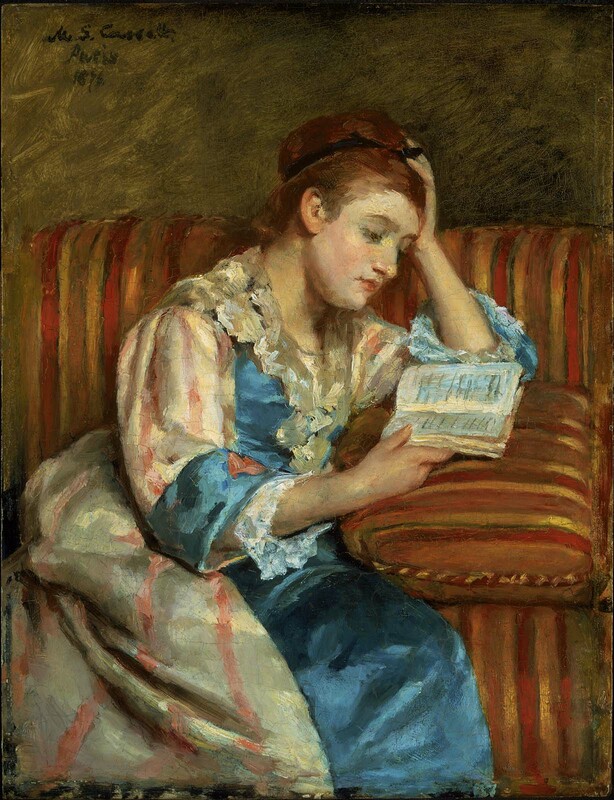 Although unfinished at the time, the artist included Girl Reading in the March 1909 “Twelfth Annual Exhibition—Ten American Painters” at New York’s Montross Gallery. One reviewer noted that the painting showed tremendous growth in Tarbell’s work: “in color this latest canvas is more beautiful than any of its predecessors…the tones are very quiet, but they seem richer and deeper.”The MFA purchased the painting directly from Tarbell shortly thereafter. 1. Edmund Tarbell to Arthur Fairbanks, December 18, 1921, curatorial files, Department of Art of the Americas, Museum of Fine Arts, Boston. 2. 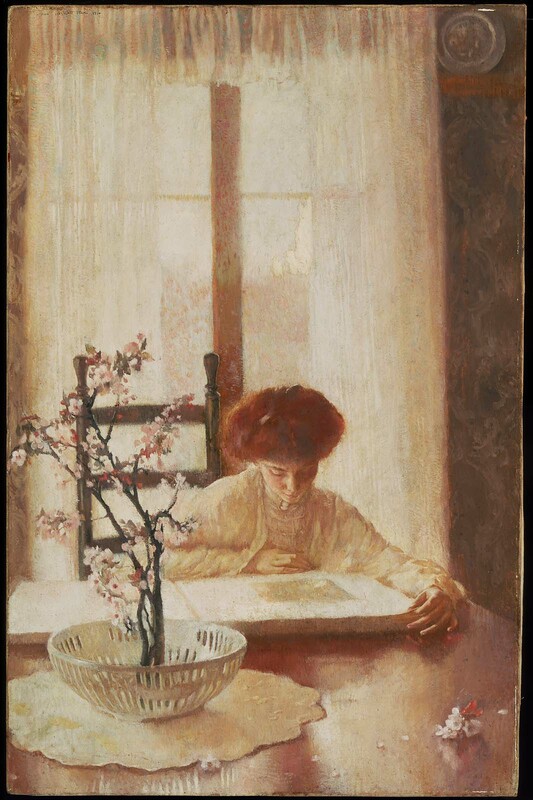 Erica E. Hirshler, “‘Good and Beautiful Work’: Edmund C. Tarbell and the Arts and Crafts Movement,” in Impressionism Transformed: The Paintings of Edmund C. Tarbell, by Susan Strickler, Linda J. Docherty, and Erica E. Hirshler, exh. cat. (Manchester, N.H.: Currier Gallery of Art, 2001), 75. 3. Philip Hale, Jan Vermeer of Delft (Boston: Small and Maynard, 1913), 229–31. 4. Hirshler, “‘Good and Beautiful Work,’” 80. 5. Tarbell quoted in Hirshler, “‘Good and Beautiful Work,’”, 74. 6. See, for example, Patricia Hills, Turn-of-the-Century America (New York: Whitney Museum of American Art, 1977), 74, and Bernice Kramer Leader, “The Boston Lady as a Work of Art: Paintings by the Boston School at the Turn of the Century” (PhD diss., Columbia University, 1980), 86, 245. 7. Charlotte Barton West letters, 1904–7, roll 75, Archives of American Art, Smithsonian Institution, Washington, D.C.
8. Susan Strickler, “A Life that Is Art: Edmund C. Tarbell in New Castle,” in Strickler et al., Impressionism Transformed, 2001, 137. 9. Patricia Jobe Pierce, Edmund C. Tarbell and the Boston School of Painting, 1889–1980 (Hingham, Mass. : Pierce Galleries, 1980), 87. 10. “Art Exhibitions: New Pictures by The Ten American Painters,”New York Daily Tribune, March 20, 1909, 7, col. 1. The artist; Gorham Hubbard; to MFA, 1912, gift of Gorham Hubbard. 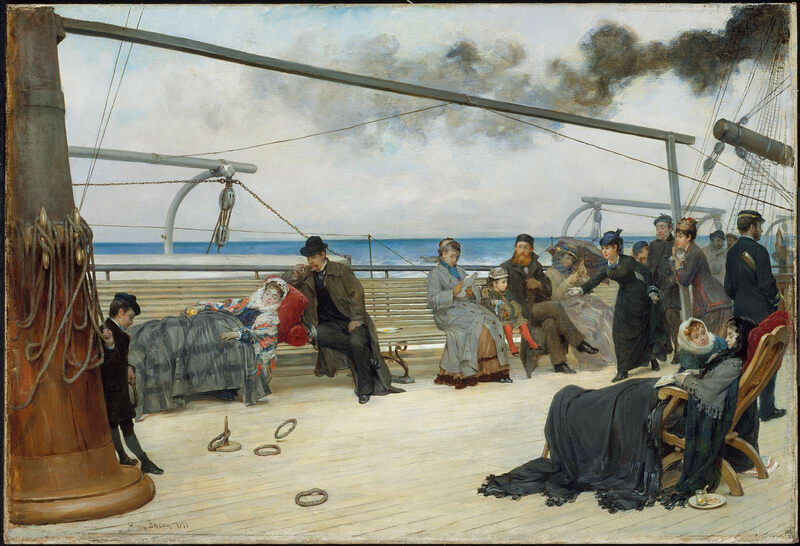 On the Open Sea-- The Transatlantic Steamship "Péreire"
The artist; Mrs. Edward Livingston Davis; to MFA, 1912, gift of Mrs. Edward Livingston Davis. Richard Cumberland was one of the best-known writers of the day and friend to leading painters, poets, and actors. Here, his daughters, Elizabeth and Sophia, read his latest play, The Fashionable Lover. Romney constructs an affectionate and subtle narrative with the sisters’ differing responses. Elizabeth is on the cusp of adolescence and dressed in an “adult” gown: her dreamy stare suggests that the theme of fashionable love has sparked her imagination. Sophia, slim and childish in a green smock, struggles to understand the meaning of her father’s words. After 1772-3, commissioned from the artist by Richard Cumberland (b. 1732 - d. 1811) Cambridge, UK [see note 1]; by 1811, inherited by Sophia Cumberland (Mrs. William Badcock), (b. 1761 - d. 1823); after 1823, by descent through the family to Rev. W.R. Brodrick, (grandson of Sophia); March 19, 1892, Brodrick sale, Christie's, London, lot 724, bought in to F.H. Brodrick [see note 2]; June 14, 1902, Anonymous sale, Christie's, London, lot 91, to Agnew's, London (stock no. 518); 1902-4, sold by Agnew's to T. J. Blakeslee & Co. Galleries, New York; by 1909, purchased by Robert Dawson Evans (b. 1843 - d. 1909), Boston; 1909, inherited by his widow, Mrs. Robert Dawson Evans (Maria Antoinette Hunt) (b. 1845 - 1917), Boston; 1917, bequest of Mrs. Robert Dawson Evans to the MFA. (Accession date: November 1, 1917). A prolific playwright and father of the sitters, Elizabeth (b. 1759/60 - d. 1837) and Sophia (b. 1761 - 1823), Kent. 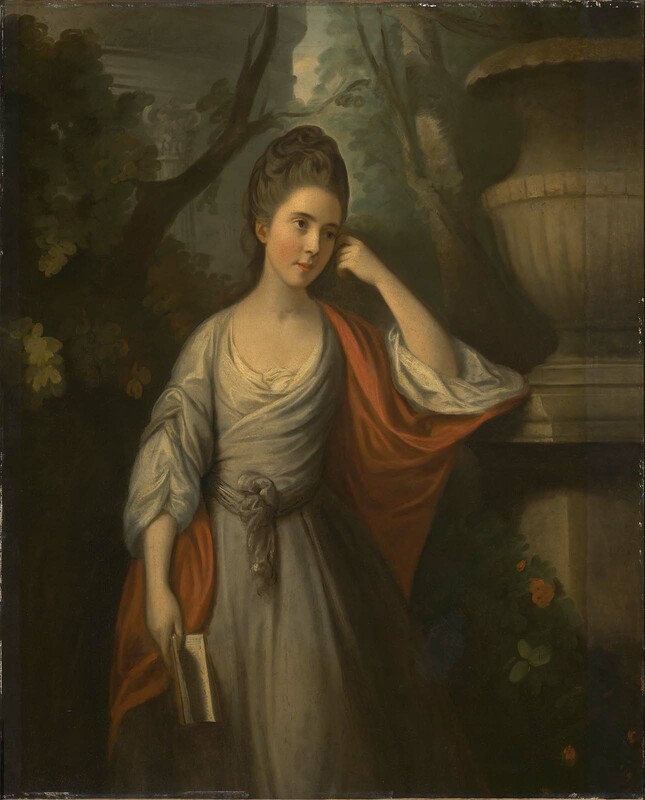 Elizabeth, (holding her father's 1772 play, The Fashionable Lover), would later become Lady Edward Cavendish-Bentinck, while Sophia would later become Mrs. William Badcock, then Mrs. Reese. F.H. Brodrick lent the painting to the 1900 Grafton Galley Exhibition, London, no. 96. 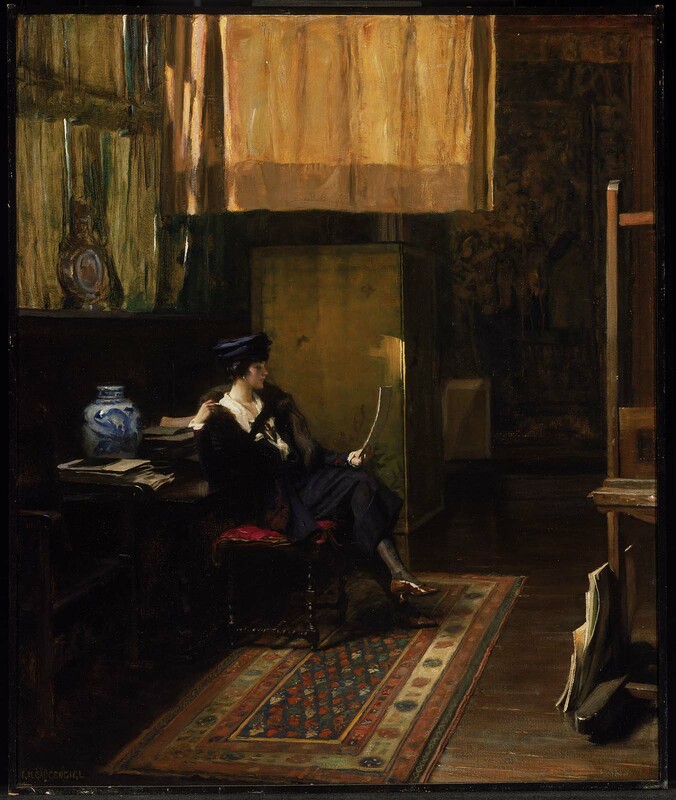 The artist; with Frank W. Bayley; to MFA, 1923, purchased for $3,000. 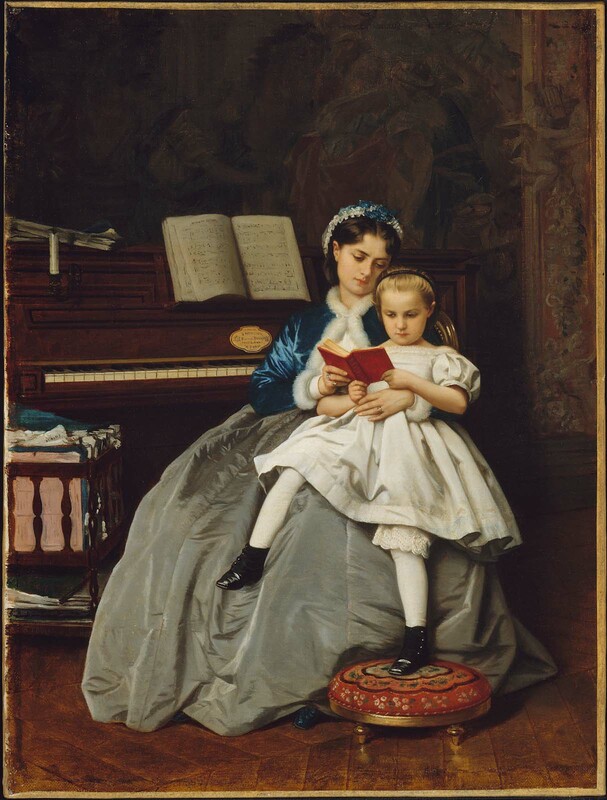 In an elegant interior, a young mother gives her daughter a reading lesson. Though a voluminous skirt and a jacket lined with swan’s down identify her as a fashionable lady of the Second Empire, the woman seems to take even more pains with her daughter’s education than with her own appearance. 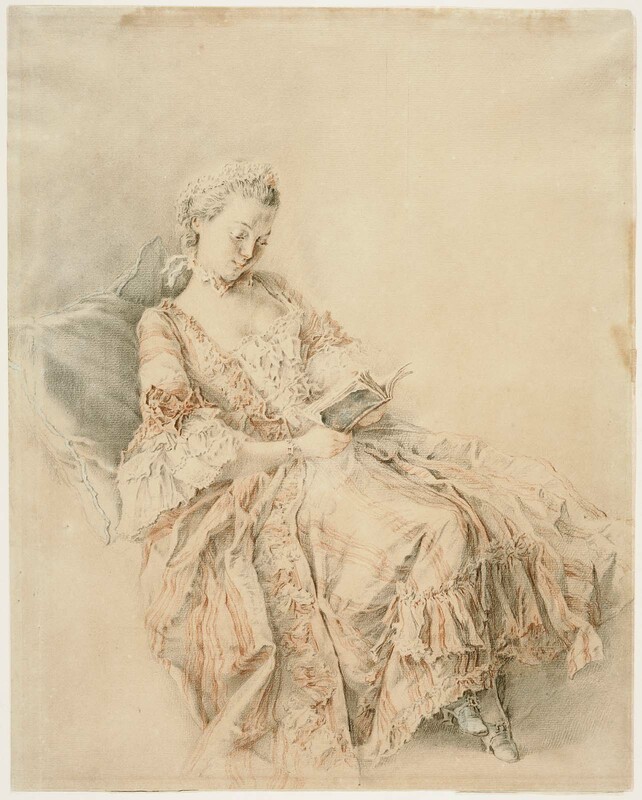 Described as a “poet and historian of fashion” by his contemporaries, Toulmouche captured not only the attire of the modern parisienne but also the bourgeois domestic values of his era. Getty Provenance Index, Goupil et Cie. records, PI Record Nos. G-1707 (stock book 2, no. 1716, p. 179), G-16105 (stock book 4, no. 3282, p. 53), and G-4251 (stock book 3, no. 3282, p. 186). According to notes in the curatorial file, there is a Noyes and Blakeslee label on the reverse of the painting's stretcher. Women artists found Boston to be a particularly supportive environment for their professional activities. 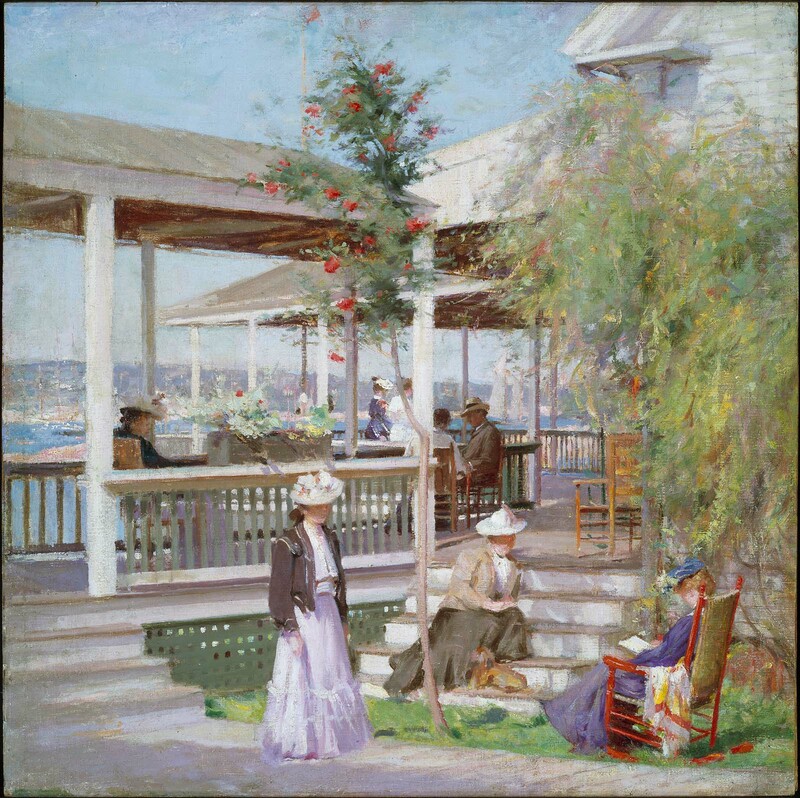 Lilian Westcott came to the city from Hartford, Connecticut, with a scholarship to study painting at the School of the Museum of Fine Arts, Boston. She worked with Edmund Tarbell [09.209] for two years, but left the program when she married Philip Hale [1996.332], a professor of drawing there. He supported her career even after their daughter Nancy was born in 1908, and Lilian Westcott Hale became an integral part of Boston’s closely knit community of like-minded artists. Many of them were women; one of Lilian Hale’s best friends was another woman painter—her sister-in-law, Philip Hale’s older sister, Ellen Day Hale [1986.645]. 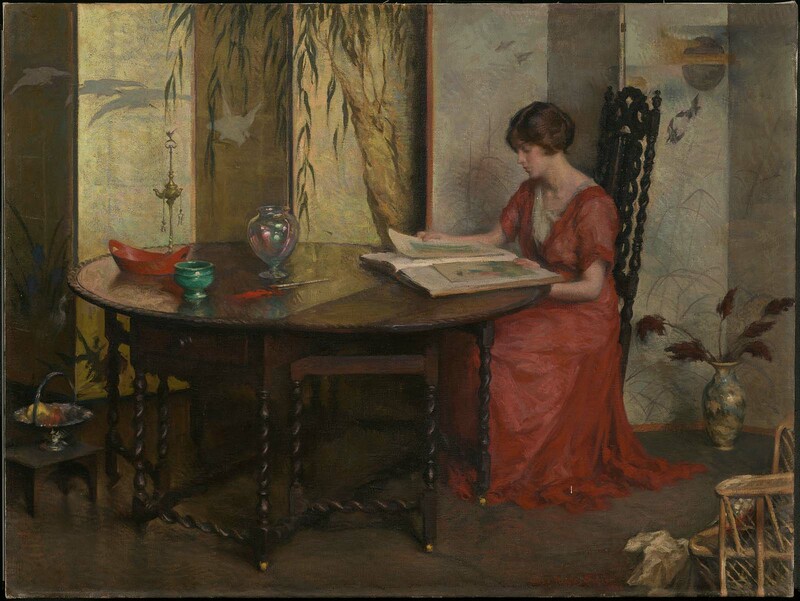 Lilian Hale’s ethereal images of contemplative women in interiors won her much critical and popular acclaim during her lifetime, and collectors sought them avidly. She staged her compositions with models in her studio, sometimes creating both charcoal and oil versions of the same theme. A related and highly finished charcoal drawing entitled Spring Morning [65.1336], dated 1908, employs a composition similar to this one, but it substitutes a bowl of daffodils for the branch of cherry blossoms seen here. In L’Edition de Luxe Hale posed her favorite model, Rose Zeffler (called Zeffy), with a book in front of a window and allowed soft light, filtered by curtains, to bathe the scene in a rosy glow. These pink tones echo in the delicate flowers, the polished table, and Zeffy’s coppery hair. Carefully balanced and exquisitely rendered, the whole composition is an “edition de luxe,” just like the luxurious volume the young woman holds and to which the painting’s title refers. The composition reflects Hale’s belief in the importance of beauty and craftsmanship. Her traditional artistic ideals, however, did not prevent her from pursuing an active and successful professional career. Hale’s images of quiet women earned her national recognition. This text was adapted from Elliot Bostwick Davis et al., American Painting [http://www.mfashop.com/9020398034.html], MFA Highlights (Boston: MFA Publications, 2003). Upper left: Lilian Westcott Hale 1910. During the 1870s, Johnson frequently visited his sister Harriet May and her family, who spent summers on a farm in Kennebunkport, Maine. He often used Harriet’s children as models, capturing their carefree play. 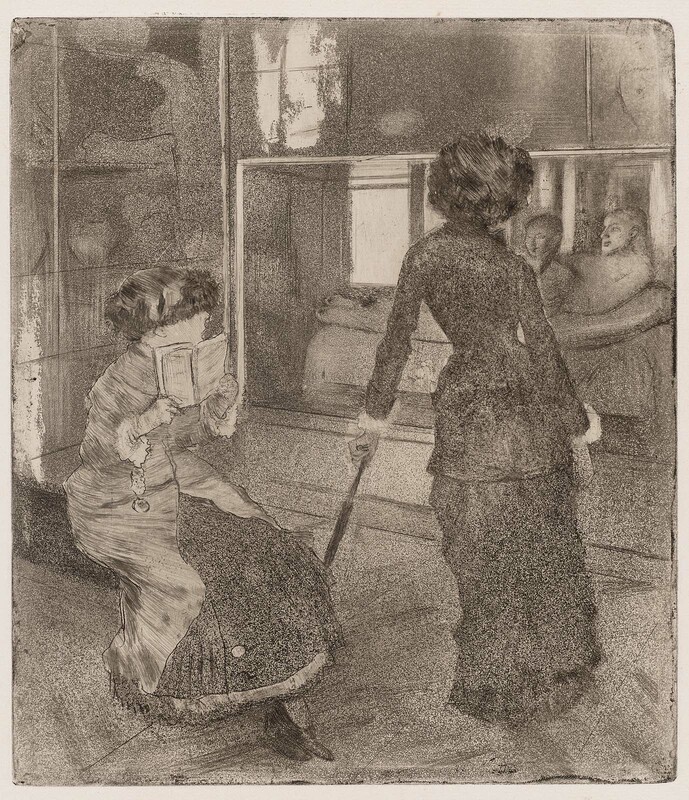 “The Little Convalescent” is probably a picture of Harriet reading to one of her children, who is sick in bed-his condition alluded to by the medicine bottles, thermometer, bell, and toothbrush in the background. 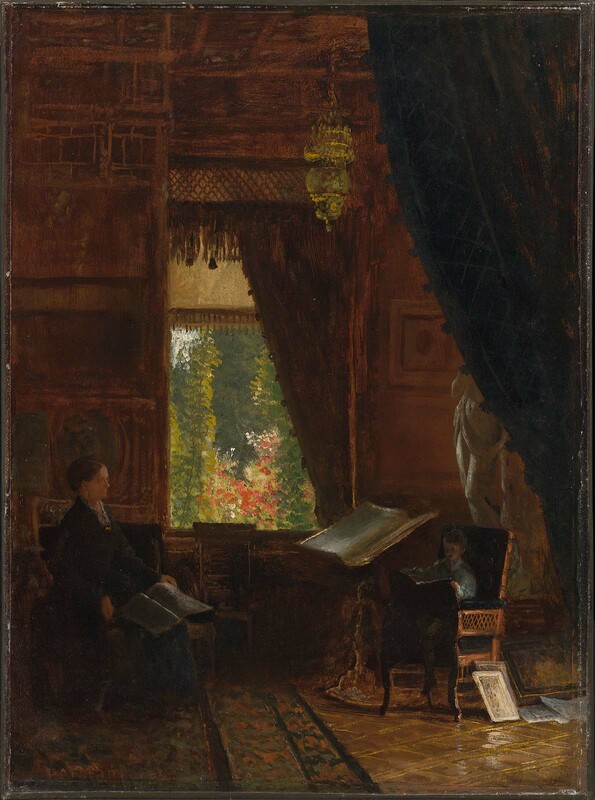 While Harriet concentrates on the book, caring for her son’s mind as well as his body, the little boy turns to look at the artist. 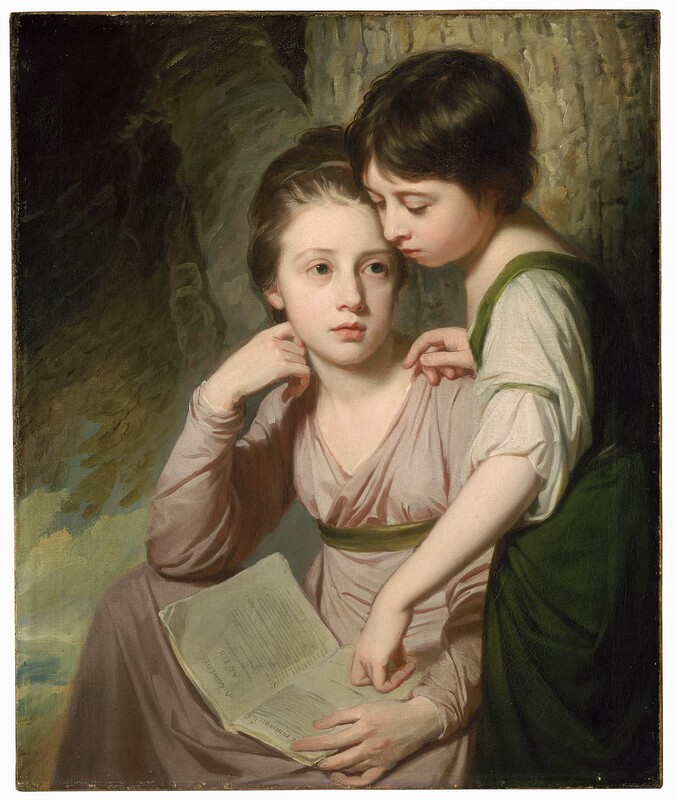 Johnson painted a number of pictures of children reading or writing, to suggest they would grow up to be thoughtful, responsible adults. The best known of these depicts the boy Abraham Lincoln-who would serve as United States president during the Civil War-reading by firelight. 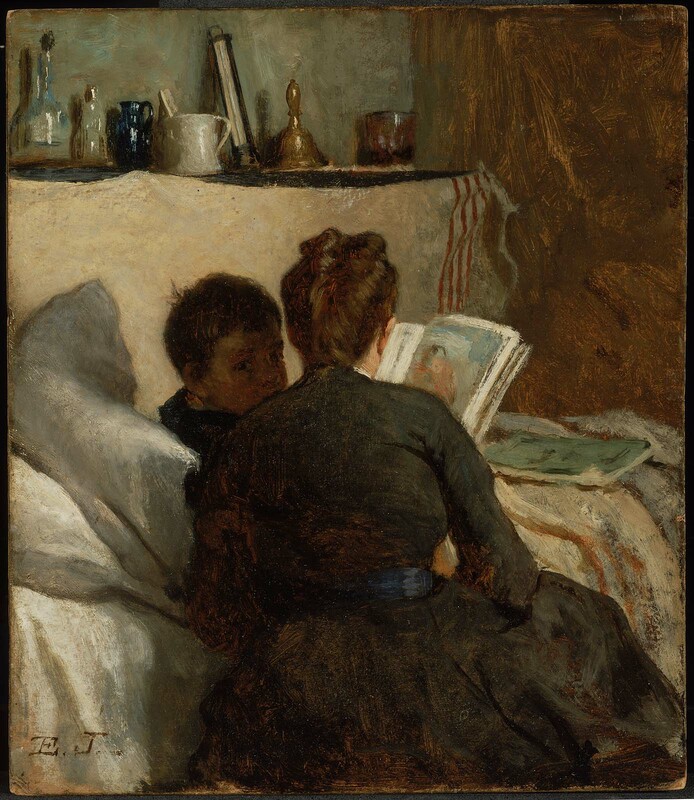 “The Little Convalescent” is also one of several tender pictures of mothers nurturing their children that Johnson was inspired to paint after the birth of his only child in 1870. Johnson’s fame as a genre painter rests not only on his quiet domestic scenes but also on his series of canvases depicting maple sugar production, corn husking, and cranberry harvesting. These were all quintessential New England rustic activities, and Johnson included children in most of the compositions. The artist; Mrs. Eastman Johnson, his wife; with Eastman Johnson Sale, American Art Association, New York, no. 12, Feb. 26-27, 1907; W.B. Cogswell, Syracuse, New York, 1907; descended to the Misses F. Pearl and Elizabeth Browning, Syracuse, his granddaughters, by 1920; with Norman Hirschl, New York; to MFA, 1940, purchased for $500. The artist; private collection, New Haven, Conn.; with Victor Spark, New York, 1946; to Maxim Karolik, Newport, R.I., 1946; to MFA, 1947, gift of Martha C. (Mrs. Maxim) Karolik. Born and raised in Pennsylvania, Cassatt settled in Paris in 1875 and became the only American invited to exhibit with the Impressionist group. Like her friend Edgar Degas, she was a figure painter, attracted to intimate views of modern life. Cassatt focused on depicting the domestic and social lives of upper-class women, showing them drinking tea, attending the opera, crocheting, or reading. The artist; to Mary E.G. Duffee, the subject; to Frances Harold Duffee, her daughter, 1894; to E.D. Levinson, Cedarhurst, N.Y.; with Wildenstein & Co., New York; to John T. Spaulding, Boston, 1934; to MFA, 1948, bequest of John T. Spaulding. The artist; to MFA, 1951, gift of Laura Coombs Hills. Folk art- landscapes. 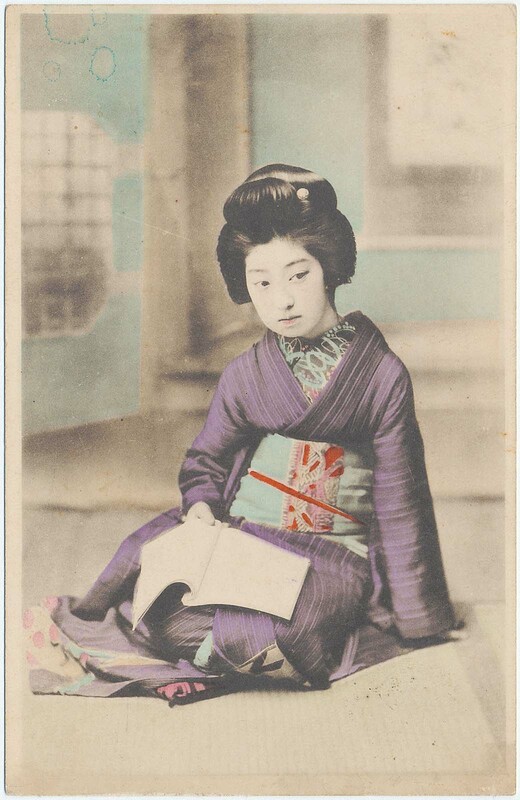 At right young woman seated under tree, musing over open album. Village on hillside left, beyond stream in center. Brushwork imitative of embroidery. 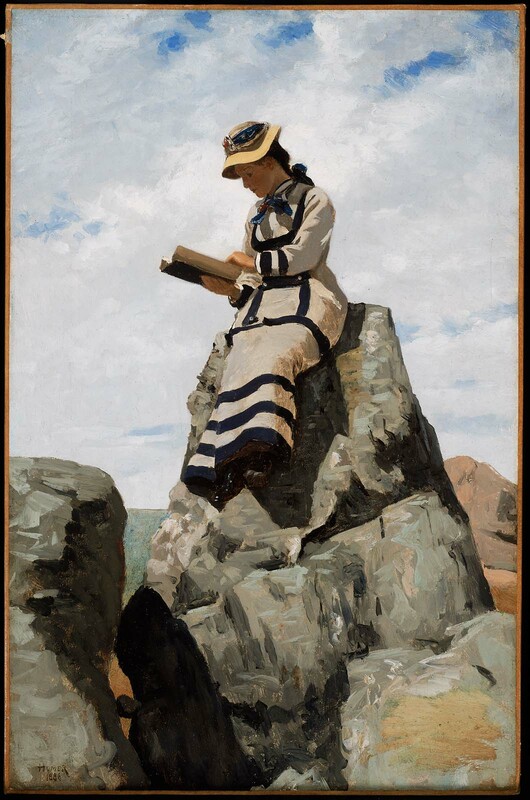 This painting, which Brown exhibited in 1892, bears a false signature of Winslow Homer. The artist; Walstein C. Findlay, Jr., by about 1959; to MFA, 1961, gift of Walstein C. Findlay, Jr. The artist; to Edward Bierstadt; with Anderson Auction Co., New York, "Edward Bierstadt Sale," April 27, 1905, no. 29, but returned to owner; with American Art Galleries, New York, "Mrs. A. G. Hunt -- Edward Bierstadt Sale," January 22, 1908, no. 60; to Mrs. H. Busch; Maxim Karolik, Newport, R.I., 1961; to MFA, 1962, gift of Maxim Karolik. Erastus Salisbury Field is one of America’s best known and most admired folk painters. At the end of his life, an article appeared in a newspaper from central Massachusetts, where he lived, praising his portraits. The account indicated that they were as “nearly correct as can well be made in oil, and give to posterity faithful ideas of the personal appearance of their ancestors” (“Greenfield Gazette and Courier,” June 9, 1900). During the 1830s, there was such a demand for Field’s work among middle-class patrons in his area that he developed a formula of quick brushwork, standard poses, and a limited number of decorative elements (such as gaily painted floors) that enabled him to complete a portrait in a single day. However, beginning in the 1840s, the increased popularity of daguerreotypes (an early form of photography) threatened the market for his portraits. 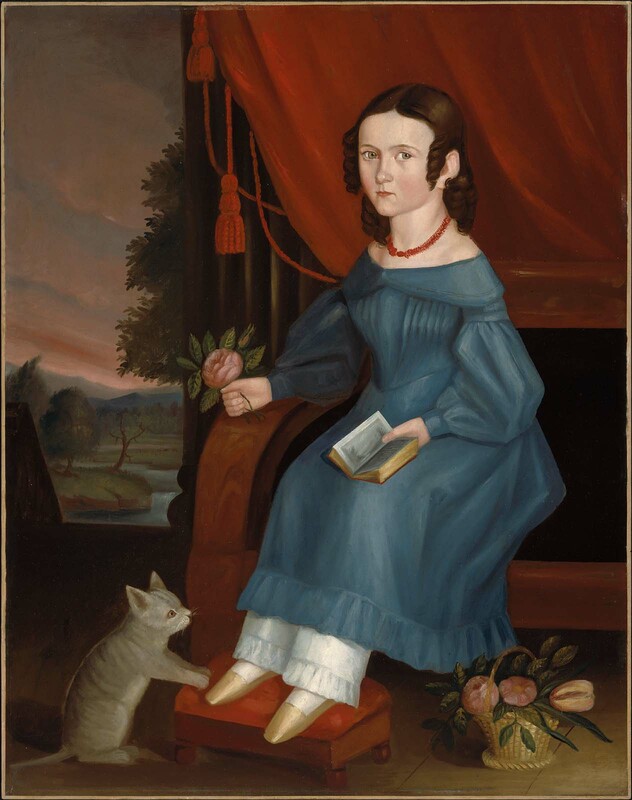 This painting, of Field’s niece Margaret Gilmore, was one of his most ambitious and was sent to the 1845 annual fair of the American Institute of the City of New York to demonstrate his superior skills and to appeal, perhaps, to more upscale patrons. The painting is unusually large for Field’s single-figure portraits and shows the sitter nearly life-size and close to the picture plane. Margaret’s pose is rigid and conventional, and her body inaccurately drawn, but the carefully chosen and brightly colored clothes and furnishings give the painting great appeal. Her dress, with its square neckline, high waist, and puffy sleeves, was the height of fashion in the late 1830s. By the mid 1840s, this style had become popular among the middle class. The ropes of pearls around Margaret’s neck and bust and the gay rainbow-colored fan she holds were also sought-after fashion accessories that advertised the wearer’s good taste. The table and painted floor cloth were comfortable middle-class furnishings and appear in a number of Field’s portraits. But in place of the painted chair in which he usually posed his sitters, here he introduced a high-style upholstered chair with a curved back outlined by a carved scale motif popularized by the French-born furniture maker Charles Lannuier. The presentation of his subject’s character was calculated to please: the books remind the viewer that Margaret is diligent and well educated; her pleasant expression conveys her good nature; and the crouching cat (who appears in a number of Field’s portraits of young girls, alluding to their kindness to pets) also indicates her amiability. The artist; Mr. and Mrs. Hilliker, Shelton, Conn., until about 1949; Mr. and Mrs. Stephen S. Racz, about 1955; with Israel Sack, New York; to Maxim Karolik, Newport, R.I., 1960; to MFA, 1964, bequest of Maxim Karolik. Abraham Tuthill was born on Long Island, New York. His first portraits, painted when he was twenty-two, were awkward and primitive. Determined to improve his technique, Tuthill went first to New York City and then to London, where he acquired some rudimentary skills during a period of study with the distinguished artist Benjamin West. 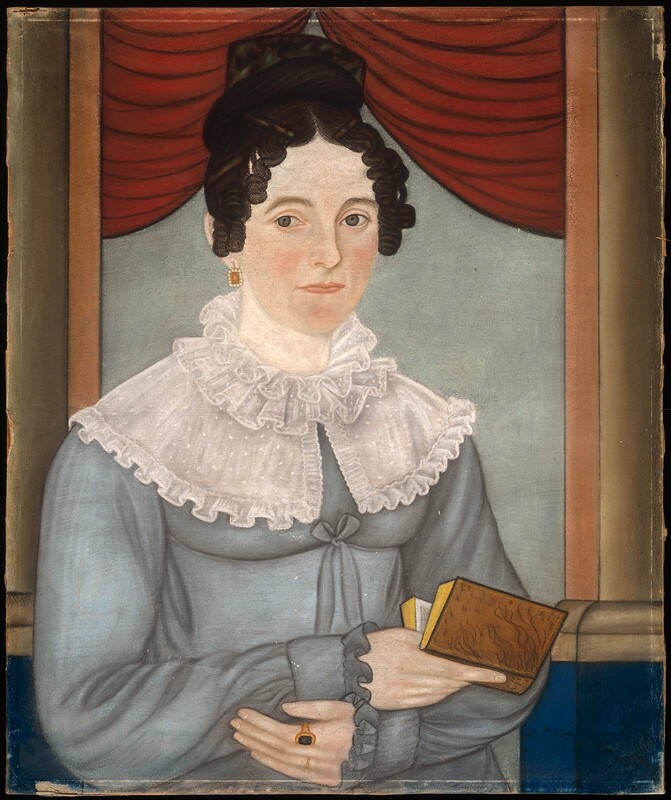 He subsequently spent some thirty-five years (between 1808 and 1843) traveling through upstate New York painting portraits that-like this one-are a mixture of the sophisticated and the naive. 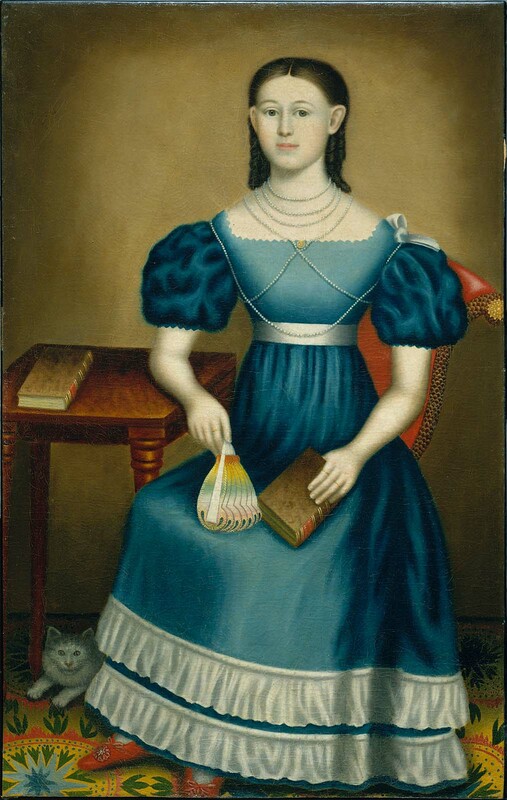 Almost nothing is known about Phoebe Drake, the charming subject of this portrait, though her clothing and the handsome furnishings of the room in which she is posed suggest her family was well-to-do. She wears gold earrings, a hairdo of tightly wound curls, and bright red shoes that peek out from beneath her French-style dress, all the height of fashion. To remind us that she is a child, not a grown woman-or perhaps because the artist was not so skilled at drawing objects to scale-she stands next to a cloth-covered table that is nearly as tall as she is. 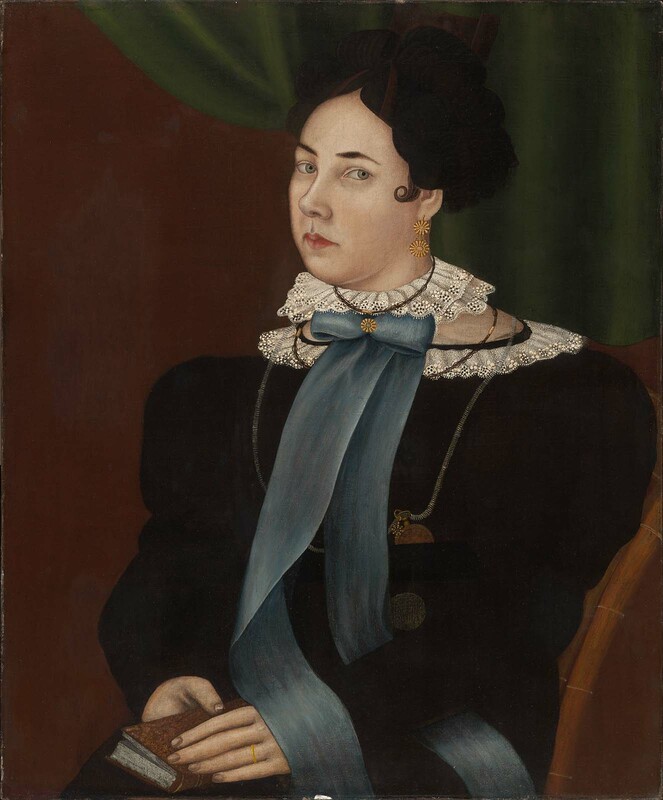 As Tuthill painted her, Phoebe’s arms are unnaturally long; her dress, strongly outlined, seems almost two-dimensional; her facial features are stylized. But despite the artist’s provincial painting style, by showing Phoebe with a frank and direct gaze, he creates the impression of an appealing, spunky child. The artist; Mrs. Fannie Currier; to Nancy Currier, her granddaughter, Chestnut Hill, Mass., about 1959-1961; to Maxim Karolik, Newport, R.I., 1961; to MFA, 1964, bequest of Maxim Karolik. 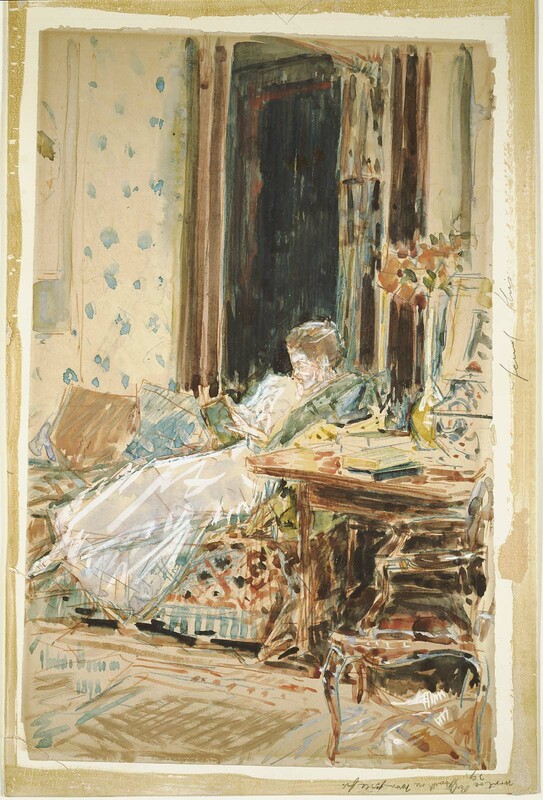 The artist; to his estate; to Mrs. G.W. Stafford, the artist's niece, Madison, N.J., 1943; with Vose Galleries, Boston, 1961; to Maxim Karolik, Newport, R.I., 1961; to MFA, 1964, bequest of Maxim Karolik. Lower left in brush: Childe Hassam/1898. Kathleen Rothe; bequest to MFA, October 13, 1965. 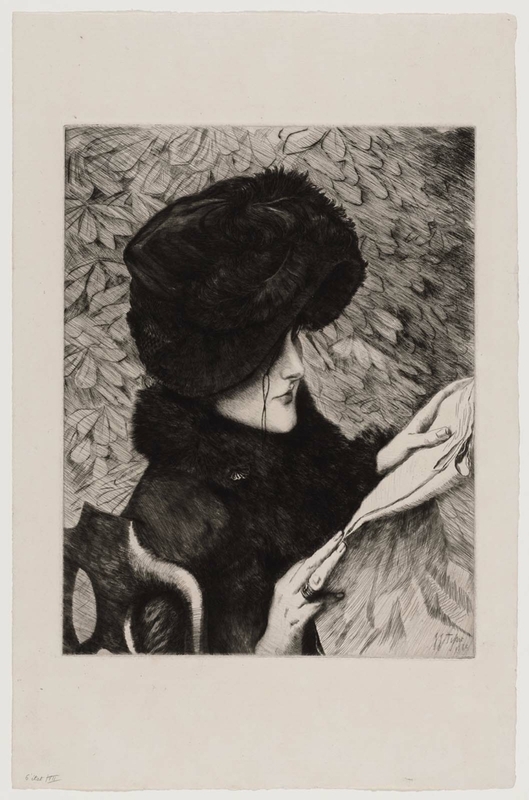 The pastel was published in 1928 by Albert Besnard, La Tour: La Vie et l'Oeuvre de l'Artiste (Paris: Les Beaux Arts, 1928), p. 177, cat. no. 612, fig. 119, as being in a private collection ("M[r]. X"), Paris. 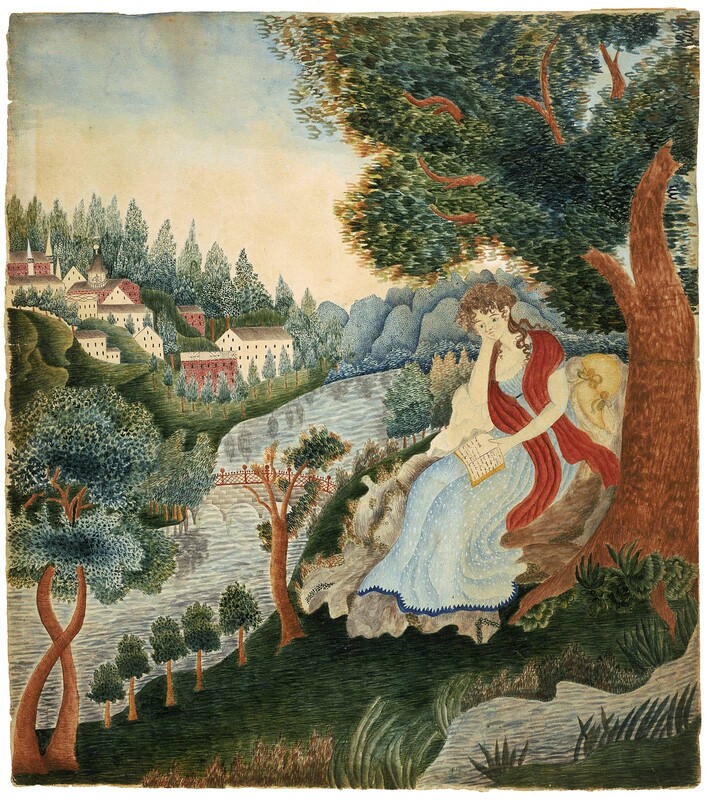 According to a letter from Mrs. Sedgwick to the MFA (July 23, 1973) the painting was purchased either by her great-grandfather Perkins or his daughter, Miss Elizabeth Perkins. According to a letter from Caroline Durand-Ruel Godfroy of Durand-Ruel et Cie., Paris, to the MFA (November 20, 2001). The painting was purchased in Vollard's name, but, according to Durand-Ruel's records, all four parties paid for it (Bernheim-Jeune, Durand-Ruel, and Vollard were experts at the sale). Seligmann acquired full possession of the paintings by 1920; in the prefatory note to the catalogue of his 1921 auction are statements by Durand-Ruel, Vollard, and Bernheim-Jeune attesting to his ownership of seventy-one paintings purchased at the Degas atelier sale. 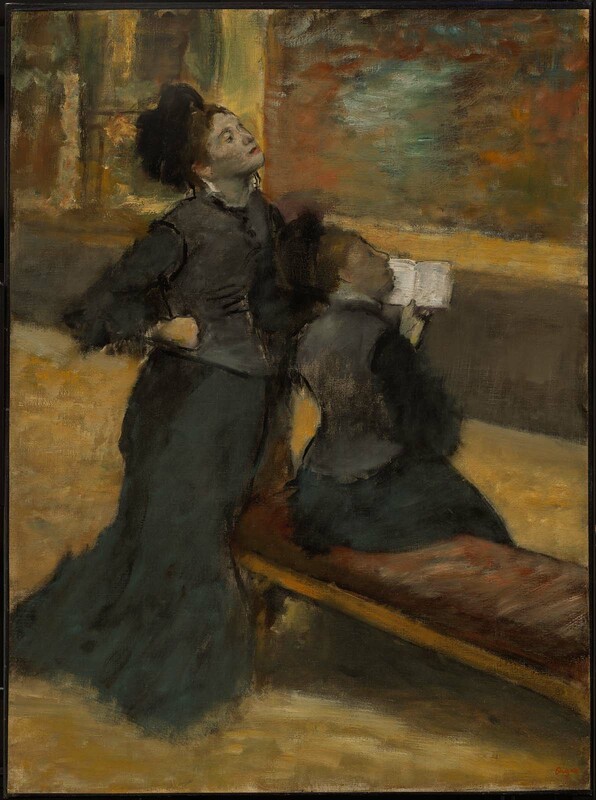 Henry D. Hughes acquired at least two other Degas paintings at the Seligmann sale of 1921 through New York dealers. It is therefore likely, though it has not been proved, that he acquired this painting through Kraushaar. Mrs. McAndrew first lent the painting to the MFA in 1964. Her mother was George C. Lee's sister; therefore she was Mrs. Lee's niece by marriage. More information on their relationship is in the MFA curatorial file. Reverse, before relining: Painted (for Miss. Eliza Whiting,/Agd 21.—) By S. Whiting Franklin,—/Oct 1829. The artist; to Eliza Whiting, the sitter, 1829; Curtis Tavern, West Granville, Mass. ; to Edgar W. and Bernice Chrysler Garbisch, 1949; to MFA, 1980, gift of Edgar William and Bernice Chrysler Garbisch. Cephas Thompson was a prolific, self-taught painter from Middleborough, Massachusetts, who earned his living as an itinerant artist. In the early nineteenth century, he traveled up and down the Eastern Seaboard, visiting numerous ports. In each city, Thompson would take up residence for several months, place a notice in the local newspaper to advertise his services, and complete many portrait commissions during his stay. His itinerary included Charleston, South Carolina (1800, 1804, 1819, 1822); Baltimore, Maryland (1804); Alexandria (1807–9), Richmond (1809–10), and Norfolk, Virginia (1810–12); New Orleans, Louisiana (1816); and Savannah, Georgia (1818). Thompson completed ninety-three portraits during his first sojourn in Bristol. Eighteen of these were of members of the DeWolf family, including this likeness of Maria DeWolf. 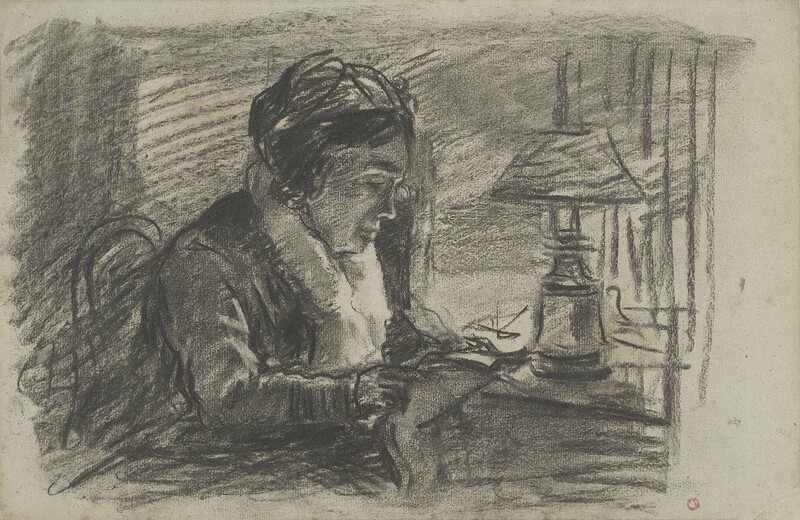 The linear quality of Maria’s portrait, a characteristic common in the work of many self-taught artists, may reflect his reliance on prints for his early drawing technique. 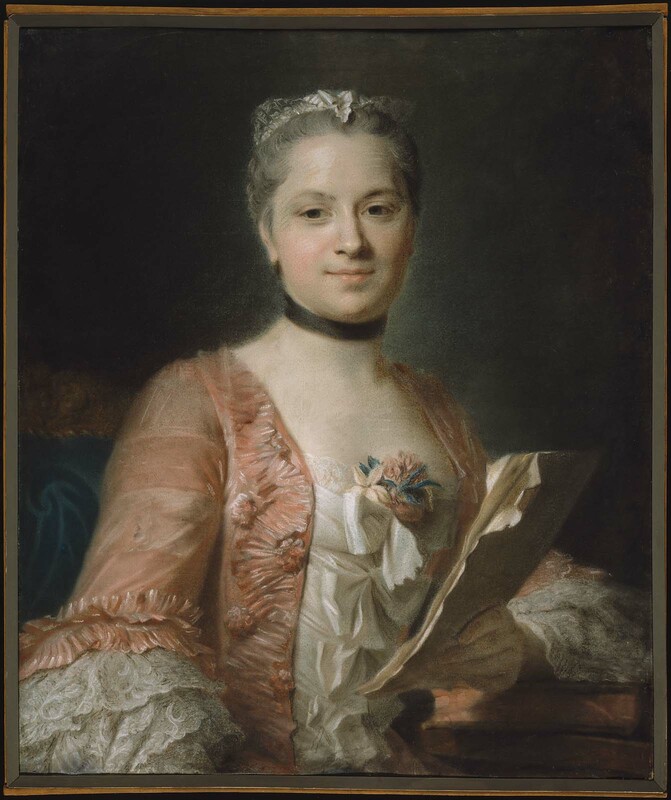 The style suggests that she was painted early in his stay, probably in 1805. Thompson demonstrated his ability to capture a likeness with his depiction of Maria’s fetching facial features and forthright gaze, and he took obvious delight in rendering the texture of her curly hair. He painted her in a fashionable empire-style white dress and included such details as the ties gathering the sleeves at her shoulders. His representation of her anatomy is much less convincing, however, with little definition to her torso and arms, and his representation of the architectural elements of the window opening reveals his disinterest in linear perspective. 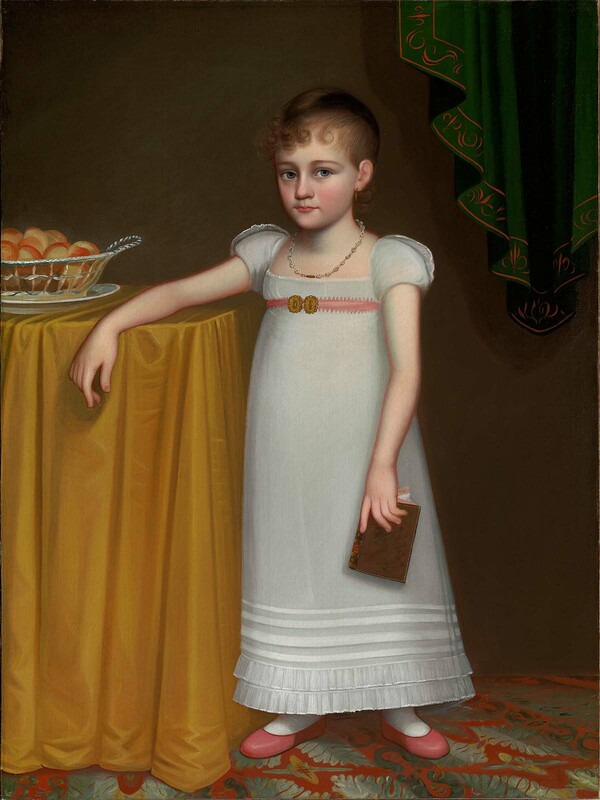 Maria DeWolf was born in 1795, and thus was about ten years old when she sat for her portrait. Thompson shows her as a serious young girl, with her hand on an open book. Maria was the daughter of William and Charlotte Finney DeWolf. William DeWolf and his brothers James (later a United States Senator), John, and Charles were merchants, operating wharves, counting houses, banks, a rum distillery, and the Mount-Hope Insurance Company, which insured their ships. They were the largest slave traders in all of North America, mounting more than eighty transatlantic voyages, most of which carried African slaves to Cuba where the family also owned sugar cane and tobacco plantations. Thompson’s “Memorandum of Portraits” (Boston Athenaeum), a list he kept of his sitters, indicates that he painted portraits of both William and Charlotte DeWolf and their five children, although only those of two children in addition to Maria’s—Charlotte and William (both Milwaukee Art Museum)—have been located. 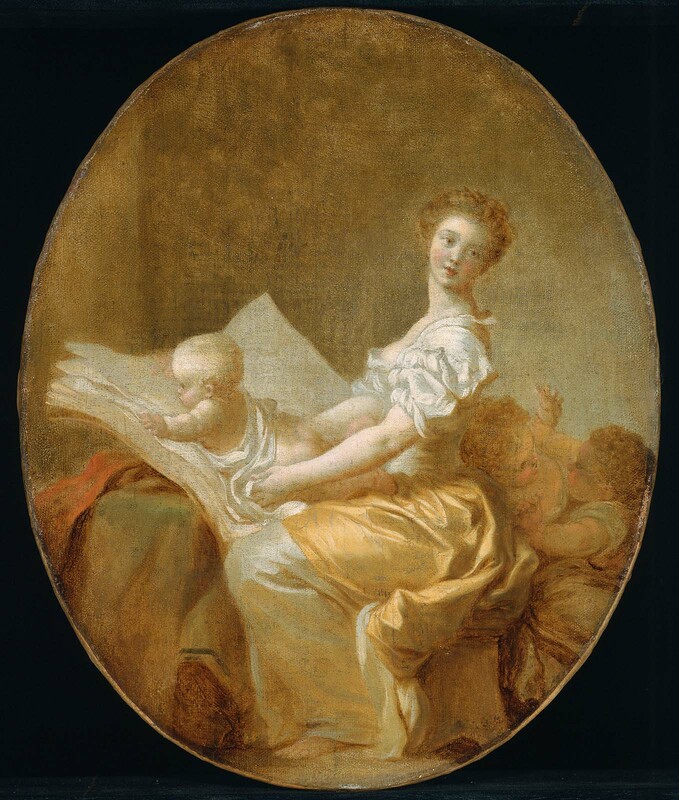 Those two canvases display a more accomplished grasp of anatomy and modeling and have similar backgrounds, and are thought to have been painted somewhat later than Maria’s. Maria married Robert Rogers (1792–1870), a native of Newport, Rhode Island, in 1814. Soon after his marriage, Rogers formed a business connection with his father-in-law that lasted until William DeWolf’s death in 1829. Rogers was also a prosperous merchant, president of the Bristol’s Eagle Bank, and by the end of his life the wealthiest citizen of Bristol, leaving an estate of over $1,300,000. He was also an avid reader and accumulated a library of several thousand volumes. In keeping with his interests, Maria DeWolf Rogers built the Rogers Free Library in Bristol in 1877, seven years after her husband’s death, and named it after him. She gave the library 4,000 volumes from her husband’s collection and 1,200 new volumes that she purchased with her sister Miss Charlotte DeWolf. She gave the remainder of her husband’s books to the Redwood Library in Newport. Maria DeWolf Rogers died in 1890. 1. See Deborah L. Sisum, “‘A Most Favorable and Striking Resemblance’: The Virginia Portraits of Cephas Thompson (1775–1856),”Journal of Early Southern Decorative Arts 23, no. 1 (Summer 1997): 1–101. 2. Susan Parsons, “Recent Accessions to the Society’s Museum Collections: Portraits of Captain and Mrs. Isaac Manchester,”Old-Time New England 40, no. 2 (October–December 1964), 52. 3. Brown University Steering Committee on Slavery and Justice, Slavery and Justice, report of the Brown University Steering Committee on Slavery and Justice (Providence, R.I.: Brown University, 2006), p. 10, accessed August, 15, 2011, http://www.brown.edu/Research/Slavery_Justice/documents/SlaveryAndJustice.pdf. 4. Charles O. F. Thompson, Sketches of Old Bristol (Providence, R.I.: Roger Williams Press, 1942), 216ff. 5. I am grateful to Reinhard Battcher III, Joan Prescott, and Kristin Calouro of the Rogers Free Library for providing information on Maria DeWolf Rogers. Paul McCarron and Susan Schulman, NY, 1996; Dr. James and Melinda Rabb; gift September 1999.
the artist; to Elizabeth B. Brewster, niece of the artist, 2001; to MFA, 2004, gift of the estate of Elizabeth B. Brewster. Note on back: "Bought May 2, 1891, in Auvers-sur-Oise, S et O, from Mme. Veuve Karl Daubigny by S. E. C. Oliver"
Leonard A. Lauder Collection, Museum of Fine Arts, Boston, Fractional gift of Lauder (Accession date: March 20, 2002). Francois Alexandre-Frederic de la Rochefoucauld (b. 1747-d. 1827) Paris; June 20-23, 1827, posthumous La Rochefoucauld sale, through Roland and Laneuville, Paris, lot 19 [see note 1]. Madame Corbin, Paris [see note 2]. February 20, 1945, sold by Wildenstein and Co. New York, to Forsyth Wickes (b. 1876- d. 1964), New York and Newport, RI; 1965, bequest of Forsyth Wickes to the MFA (Accession Date: January 8, 1969). In the same lot as its (now lost) companion, "a mother making her child say 'please' before giving him some bread," (see Zafran catalogue, 1998, no.59). According to Wildenstein at the time of the sale to Forsyth Wickes.